Although sightings of Large manlike creatures in North America pre-date the arrival of Europeans, reports of footprints however are more recent and there is a mention of large tracks in the early 19th Century. An early settler by the name of David Thompson, crossed the rockies near the present site of Jasper, Alberta in the winter of 1811. He mentions coming across the tracks of a large animal. 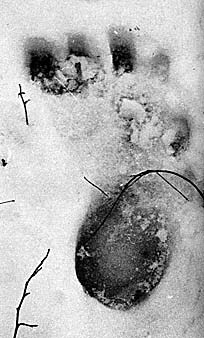 The entry in his journal reads..
Footprints as significant evidence for the existence of Bigfoot really came to the fore during the 1950’s in the Bluff Creek area. phrase ‘Bigfoot’ being used for the first time (left). John Green has said that as of 1980 he had over 200 track reports from Northern California alone, going back as far as 1870. The oldest was a picture of a track taken in 1947. There is also a great divergence in sizes of the tracks with lengths ranging from 7 to 22 inches. Based on his collection John Green works out an average of 16 inches. One of the first scientists to take footprints seriously was the the late Smithsonian primatologist John Napier. Based on the lengths of the footprints, he tried to determine the stature of the creature making them. He used the following formula which he says gives a reasonablly accurate method of calculating the relationship in man, and which he says would also hold good in a bipedal hominoid such as the Bigfoot. Using this formula, he shows an inconsistency in the Patterson film. 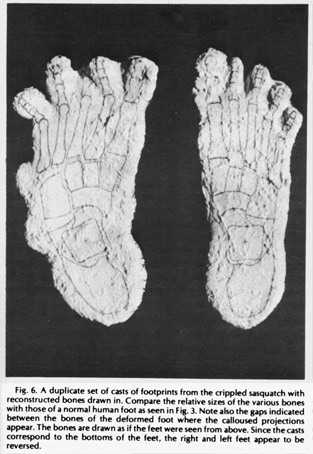 Namely that the footprint length of 14 - 15 inches indicates a stature of between 7 ft. 8 in. and 8 ft. 3 in. rather than the 6ft. 9 in. as suggested by John Greens reconstruction. The problem with this type of analysis is that Napier is in effect applying a known relationship (formula) to an unknown animal. There is no evidence that the above formula can be applied to Bigfoot. The two types of foorprint tracks that Napier refers to is the ‘hourglass’ type found in Northern California and the the ‘Human’ variety found in washington state. This is interesting, particularly due to the fact that recently, the family of Ray Wallace, who had been a construction worker in Bluff Creek at the height of the footprint finds, had admitted that he had hoaxed the footprints. This leads to the sixty four thousand dollar question, are all supposed Bigfoot prints fake? or are they are misidentified bear tracks. Perhaps even, they may be real tracks but belong to human individuals with large feet. Its unlikely but do happen. One basket ball player had a size 20 running shoe displayed in a shop. It was 15 inches long and larger than some Bigfoot tracks found. 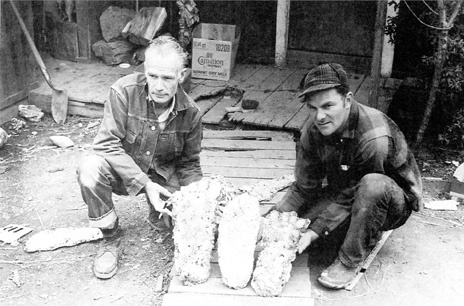 The late Grover Krants, one of the four hoursemen of sasquatchery, noted in his book Big footprints, that Bigfoot tracks are approximately 30% wider than human footprints. One would have assumed that if someone wanted to perpetrate a Footprint hoax, they would have merely used a template of an enlarged human foot. have confused the two. 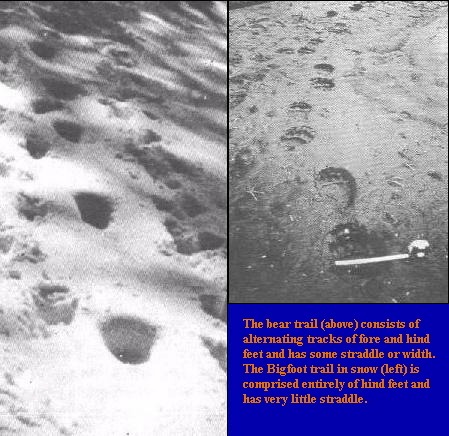 But, a more thorough observation reveals 2 major differences between bear tracks and those of the Bigfoot. The first is the actual shape. This may seem obvious, but it is an important difference. The second difference is that unlike Bigfoot tracks, bear tracks show claws, and unlike other animals, bear claws are not retractable. Bigfoot tracks however, only show toes. Bear prints also has a pointed heel. Perhaps then, going back to the Journal entry of David Thompson when he came across large tracks in the winter of 1811, he may well have encountered the tracks of an unusually large bear. The most telling part of his entry describes the feet as having short claws protruding from the long toes. The toes being four inches long. However, it can be seen that bear toes are more oval in shape than Bigfoot prints in which the toes are more elongated. Exactly what David Thompson saw, i think the jury is still out. Some features are more bearlike while other features seem to push towards the Sasquatch hypotheses. The question ultimately arises, can the Bossburg footprints be hoaxes. Both Prof. Grover Krantz of Washington State University and John Napier, a British primatologist, have studied these tracks and have come to the conclusion that they could not have been faked. The tracks crossed railroad tracks, a highway, up a steep hill, and stepped over a 43 inch fence. In 1982, a us forrestry serviceman saw a Sasquatch on a logging spur road. Footprints were found and a closer inspection of the footprint casts, produced a remarkable discovery. They contained whats known as Dermal Ridges - The foots equivalant of finger prints. 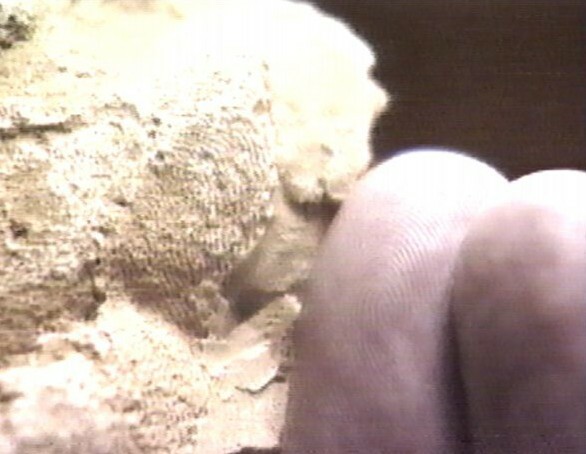 Various specialists including experts from the smithsonian Institute, Scotland Yard and even the top fingerprinting guy from a Texas Police Department analysed the casts and the majority of them concluded that the prints were not the results of a hoax. The fingerprint expert mentioned above is Jimmy Chilcutt, a latent fingerprint examiner from the Conroe Police Department. He watched Jeff Muldrum on television discussing a footprint cast he had which showed dermal ridges. 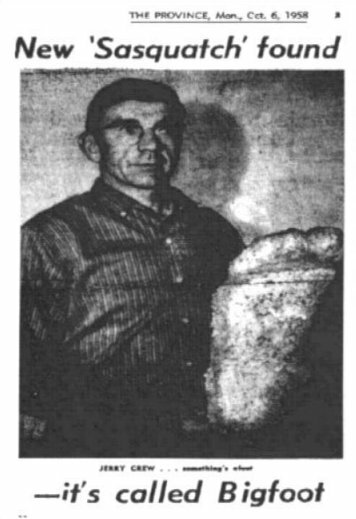 Jimmy Chilcutt was a Bigfoot sceptic and felt that his fingerprint experience could be utilised to show the cast was a hoax. He contacted meldrum who duly agreed for chilcutt to examine the cast. 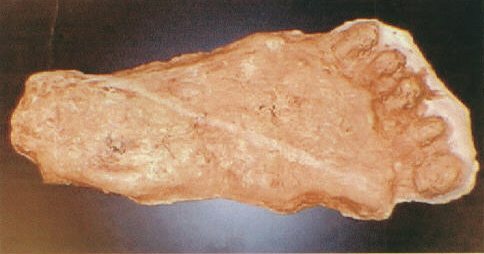 The cast in question was made by Deputy James P. Akin of the Pike County Sheriff's Office Pike County, Georgia in 1997 from an impression found in the Elkins Creek flood plain. The cast was 17.5" long and 8.5" wide. Known as the Elkins Creek casting, chilcott examined it for several months and in particular, the areas where dermal ridges appeared. He concluded his examination saying that that the dermal ridges are that of a non human primate. This conclusion he says is based on the fact that humans have creases running perpendicular to the lateral ridges on the first joint of the toes where the toe meets the foot. Chilcutt quickly turned from a sceptic to a believer and says that the 1967 blue creek mountain road cast and the 1984 Walla Walla, Table spring cast also show this type of ridge pattern. 6. 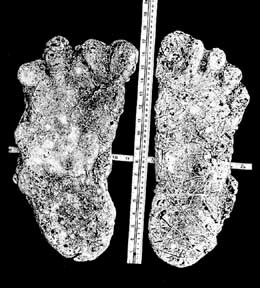 Jeff Muldrum - EVALUATION OF ALLEGED SASQUATCH FOOTPRINTS AND THEIR INFERRED FUNCTIONAL MORPHOLOGY. Jeff Muldrum - EVALUATION OF ALLEGED SASQUATCH FOOTPRINTS AND THEIR INFERRED FUNCTIONAL MORPHOLOGY. This proviso is applicable throughout the entire bigfoot-lives.com Website.